With campaign promises still reverberating about reversing policies and changes to tax laws, many are wondering how trump’s tax plan may impact their returns and overall financial future. This presidential victory was so unexpected, even for Trump supporters, that it sent the stock market into a nose dive and the telephones of financial experts ringing incessantly. Not surprisingly, since the election many Americans have been expressing deep concerns about the emerging financial environment. Many are asking what a Trump administration will ultimately mean for investors, corporate organizations, small businesses and of course; whether Trump’s tax plan will impact their returns. In a nutshell; Trump’s tax proposals simplify income-tax brackets, raise, reduce or eliminate exemptions, deductions or tax brackets. The overall analysis of his proposed tax plan is expected to reduce federal revenue by $191 billion over the first decade, increase wages by 7.7% which could also raise the GDP by 9.1%. We agree with senior fellow at the Urban-Brookings Tax Policy Center, Howard Gleckman that if Trump achieved everything he promised on the campaign trail, it is fair to say that American’s can expect major tax changes in coming months under his administration. 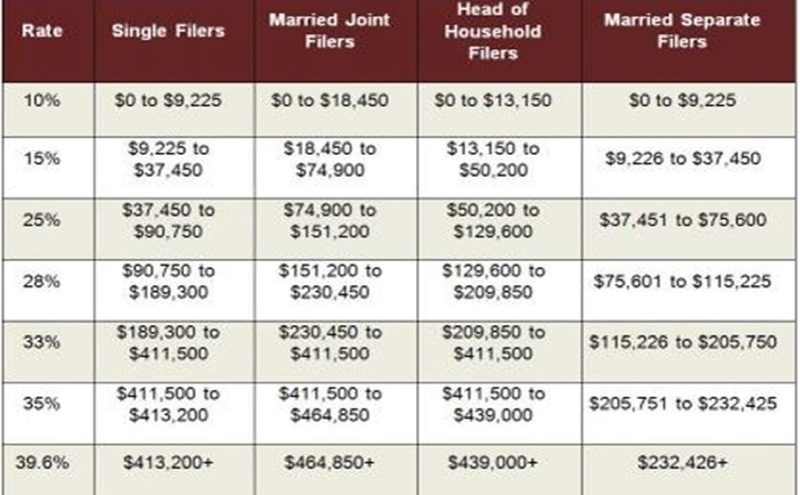 A reduction in seven federal tax brackets to three with rates of 12%, 25% and 33%. A raise in standard deductions to around four times the current levels that will translate into approximately $25,000 for single tax filers and $50,000 for people filing jointly. Implement a cap on itemized deductions at $100,000 for single filers and $200,000 for married couples filing jointly. Taxpayers earning between $48,000 and $83,000 annually could save approximately $1000. Ending personal exemptions while increasing standard deduction from $6,300 to $15,000 for single filers and from $12,600 to $30,000 for married couples filing jointly. People making $3.7 million or more can receive as much as one million dollars in savings. An end to most deductions and loopholes available to the mega-rich. Implement two tax breaks or full tax-deduction for child care for working parents. A reduction in Corporate tax rate from 39% 15% percent. Initiate a new 15% income tax code for freelancers and unincorporated small businesses. Support the return of company funds from overseas banks at a one-time discounted rate of 10%. The overall impact of the trump tax plan would reflect an average tax cut of 17.5% or $275,000 after-tax income for the ultra-rich or 1% demographic. Individuals in the 0.1% or approximately 315,000 individuals would get reductions averaging more than $1.3 million or 19%. Middle-income families would get an average tax cut of $2,700 or 5% while low-income households can expect an average of $128 or 1% tax cut. Data source: Donald Trump, Tax Foundation. In a recent interview, Financial planner Matt Logan also caution investors to be careful about making emotionally charged financial decisions at this time. Logan, whose business credo is focused on building fundamentally strong relationships with his clients suggests that you share concerns with your financial expert and work together to make necessary changes based on solid information as the financial environment evolve and change. It is also helpful to keep in mind that, regardless of what was promised during a presidential campaign, the incoming president may not be at liberty to make unilateral changes to existing tax laws.